Dhaka, 1 October, Abnews: When a coastal tide rolls out, it can reveal beautiful ripples in the temporarily exposed sand. 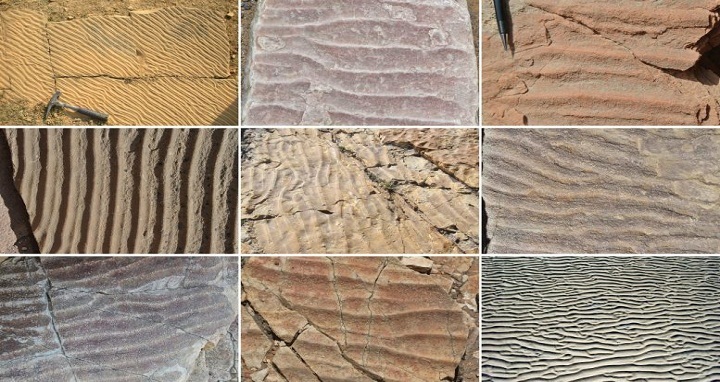 These same undulating patterns can also be seen in ancient, petrified seabeds that have been exposed in various parts of the world and preserved for millions or even billions of years. Geologists look to ancient sand ripples for clues to the environmental conditions in which they formed. For instance, the spacing between ripples is proportional to the depth of the water and the size of the waves that molded the underlying ripples. But sand ripples aren’t always perfectly parallel, carbon-copies of each other, and can display various kinks and sworls. Can these more subtle, seemingly random deviations or defects tell us something about the conditions in which a sandy seabed formed? The answer, according to researchers from MIT and elsewhere, is yes. In a paper published online and appearing in the Oct. 1 issue of Geology, the team reports that some common defects found in both ancient and modern seabeds are associated with certain wave conditions. In particular, their findings suggest that ripple defects resembling hourglasses, zigzags, and tuning forks were likely shaped in periods of environmental flux — for instance, during strong storms, or significant changes in tidal flows. Ripple defects in ancient sandbeds may also influence how fluids flow through sedimentary rocks, including underground reservoirs that hold water, oil and gas, or even stored carbon dioxide, according to Perron. In addition, he says, ripple patterns in modern sand act to roughen the seabed, slowing down ocean currents near the shore. Knowing how ripples change in response to shifting waves and tides may therefore help predict coastal erosion and flooding. Perron’s co-authors are on the paper are former MIT graduate student Kimberly Huppert ’11, PhD ’17, former undergraduate and current postdoc Abigail Koss ’12, Paul Myrow of Colorado College, and former undergraduate Andrew Wickert ’08 of the University of Minnesota. The team began looking into the significance of ripple defects several years ago, when Myrow, who at the time was spending his sabbatical at MIT, showed Perron some photos that he had taken of sedimentary rocks etched with ripples and grooves. The rocks were, in fact, ancient sandbeds that were hundreds of millions of years old. Wave-sculpted ripples form as waves travel across the surface of a body of liquid. These waves cause water beneath the surface to circle around and around, generating oscillating flows that pick up sand grains and set them down in a process that eventually carves out troughs and grooves throughout the sandbed. But how could such delicate patterns be preserved for millions of years? Perron says that various processes could essentially set ripples in place. For instance, if the water level suddenly dropped, it could leave a sand bed’s ripples exposed to the air, drying them out and hardening them to some extent, so that they retained their patterns even as more sediment slowly layered itself on top of them over billions of years. Similarly, if a finer sediment like mud or silt covers a sand bed, such as after a large storm, these sediments could blanket the existing ripples. As Perron explains, this would essentially “armor them, keeping the waves from eroding the ripples before more sediment buries them.” Over time, the sediments turn into rock as they are buried deep below Earth’s surface. Later, the rock overlaying the ripples can naturally erode away, exposing the preserved ripples at the surface again. In looking through photos of sand ripples, Perron and Myrow noticed small defects resembling tuning forks, zigzags, and hourglasses, across both ancient and modern sandbeds. “People have noticed these defects before, but we wondered, are they just random, or do they actually contain some information?” Perron says. The researchers set out to study the various wave conditions that generate certain ripple patterns and defects. To do this, they built an acrylic wave tank measuring 60 centimers wide, 50 centimers deep, and 7 meters long. At one end of the tank, they attached a motor-driven paddle, which swished back and forth to generate waves that traveled across the tank. At the other end of the tank, they erected an artificial sloping “beach” covered in a polymer mesh. This setup served to minimize any wave reflections: As a wave crashed onto the artificial beach, the energy dissipated within the mesh instead of splashing back and influencing oncoming waves. The team filled the tank with a 5-centimeter-thick bed of fine sand and enough water to reach 40 centimeters in depth. For each experiment, they set the paddle to swish back and forth at a constant distance, and recorded the sand bed as ripples formed. At a certain point, they observed that the ripples — and in particular, the spacing between the ripples — reaches a stable, consistent pattern. They recorded this spacing, along with the speed and amplitude of the paddle, and then, over 32 experimental runs, either increased or decreased the paddle’s motion, causing the ripples to morph again to either a wider or narrower spacing. Interestingly, they found that, in the process of adjusting to a new spacing, ripples formed intermediary defects resembling zigzags, hourglasses, and tuning forks, depending on the wave conditions set by the tank’s paddle. As the researchers shortened the paddle’s back-and-forth motion, this created shorter waves, narrower ripples, and patterns that resembled hourglasses. If the paddle’s motion was shortened even further — creating faster, shorter waves — a pattern of “secondary crests,” in which existing ripples appeared to form temporary “shadow” ripples on either side, took over. When the researchers widened the paddle’s motion, generating longer waves, the ripples formed zigzag patterns as they shifted to a wider spacing. The researchers observed that in all scenarios, patterns resembling tuning forks cropped up, even after ripples had reached a new, stable spacing. Going forward, Perron says geologists can use the team’s results as a blueprint to connect certain ripple defects with the water conditions that may have created them, in both the modern environment and in the ancient past.